What are Accessories Class 1 and 2? Class 1: A mechanical accessory that depends on friction, hydraulics, mechanical linkage, or pneumatic pressure for operation, including aircraft wheel brakes, mechanically driven pumps, carburetors, aircraft wheel assemblies, shock absorber struts and hydraulic servo units. Class 2: An electrical accessory that depends on electrical energy for its operation, and a generator, including starters, voltage regulators, electric motors, electrically driven fuel pumps magnetos, or similar electrical accessories. Gulf Aerospace holds an Unlimited Accessory Class 1 & 2 Rating issued by the Federal Aviation Administration (FAA). What is Gulf Aerospace’s experience on a global scale? Focusing on quality and service since 1984, Gulf Aerospace has built longstanding relationships with its global customer base. 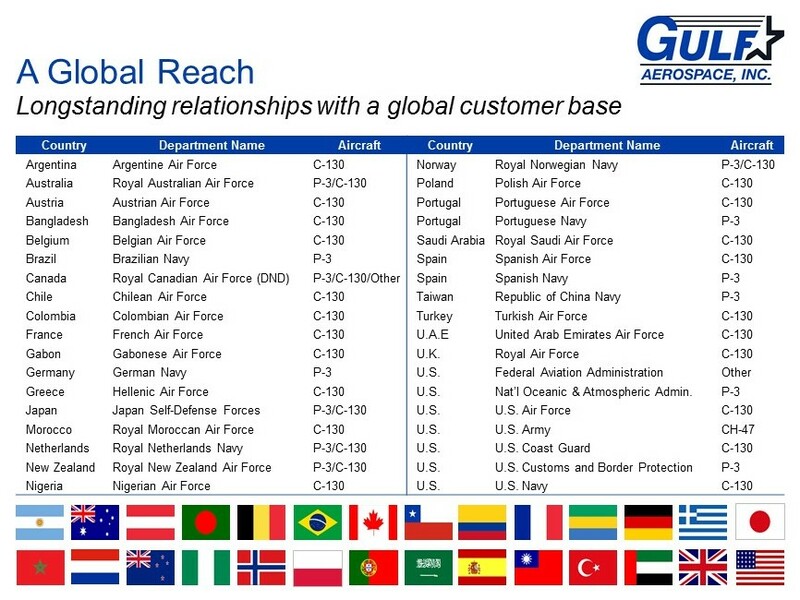 Although not an exhaustive list, the military operators below, whose accessories Gulf has repaired demonstrate Gulf Aerospace’s expansive reach. A preferred customer is one who sends work to Gulf Aerospace on a continuous on-going basis and shares our commitment to a long term mutually beneficial relationship. the aggregate of things used or needed in any business, undertaking, or operation (distinguished from personnel). the substance or substances of which a thing is made or composed. anything that serves as crude or raw matter to be used or developed. a group of ideas, facts, data, etc., that may provide the basis for or be incorporated into some integrated work. materials, the articles or apparatus needed to make or do something. a person considered as having qualities suited to a particular sphere of activity. We’re happy to answer any questions you can think of. Fill out our customer contact form, give us a call, or send us an email and we’ll get back to you with an answer as quickly as we can.